Hyundai has unveiled the first set of images of the 2020 Hyundai Sonata, which features a sporty four-door coupe silhouette. 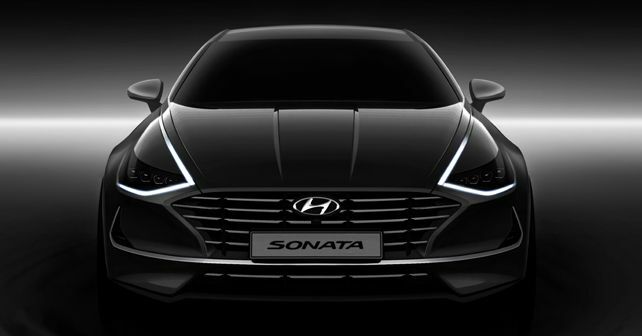 Ahead of its official global debut, Hyundai has given us a taste of what the eighth-generation Sonata is going to look like, in its production guise. Taking the four-door coupe route this time around, the next-gen Sonata is the first Hyundai model to be designed on the Korean marque's latest design philosophy – 'Sensuous Sportiness', which made its debut on the Le Fil Rouge Concept at the 2018 Geneva Motor Show. Apart from abandoning its predecessor's conventional sedan silhouette, the new Sonata also sports bigger dimensions, since it has grown in size, being 45mm longer and 25mm wider than the preceding model. Housing a roomier interior, the new Sonata has also gained an extra 35mm of wheelbase and to accommodate the sporty coupe stance, it sits 30mm lower than the old car. The chief design innovation on the new Sonata comes in the form of 'Hidden Lighting Lamps'. With integrated DRLs, the Hidden Lighting Lamps appear to be of a chromic material when switched off and produce a strong beam of light when switched on. This lighting architecture, as per Hyundai, is a first for a Hyundai vehicle. The interior of the Sonata too has been revamped and made more premium than before. The design highlight in the interior comes from the two touchscreens which have been fused into a single, seamless display with no parting lines. The steering and instrument cluster have also been replaced by entirely new units, to keep up with the new cockpit design. While the new Sonata does sound like a lucrative option in its segment, we are yet to see whether Hyundai India will bring it here. Keeping in mind the lack of demand for its previous-gen models in India, it is unlikely that we'll get to see this new-gen model here.